We are totally eggs, bacon, veggies and raw milk kind of house for breakfast most mornings, but it is nice to switch things up a few times a week! 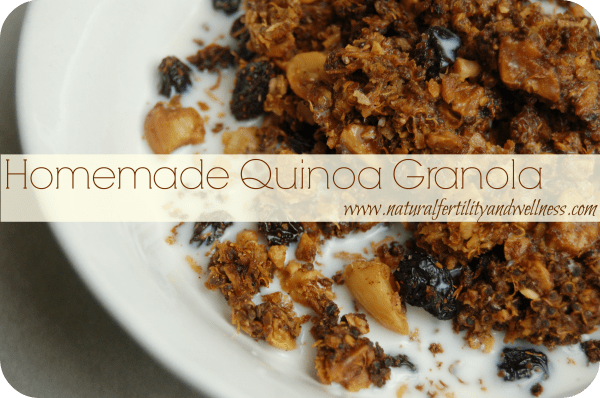 And having quick and easy breakfasts like a gluten-free quinoa granola on hand for busy mornings is a nice option. I pulled boxed cereals (even organic ones!) from our shelves years ago after learning how toxic the grains become after going through the process of being made. 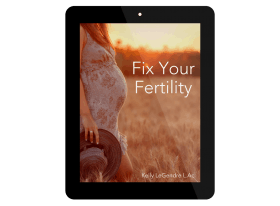 I had just spent over a year healing my gut and I didn’t want to damage it again! So any “cereal” for breakfast is usually a bowl of soaked oatmeal or homemade soaked granola cereal. I have a couple of different granola cereal options since I like to rotate my grains to keep my gut from being overloaded. 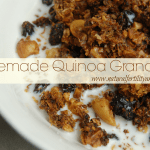 I figure most probably have had granola made with oats at one point or another, so I thought I would share my take on granola made with quinoa. It is just as delicious and I actually almost prefer it to granola made with oats since it is more filling (more protein than oats) and I like the crispy texture. This is a HUGE batch. Please feel free to halve this if you want. I may really love cooking, but I don’t like wasting time – if I’m gonna be making something that I know my family will be eating on a weekly basis, I’m making an army load of it, and storing it in my freezer! I send my husband along with a gallon freezer bag for an occasional breakfast or snack at work, keep some in a container in my cupboard, and store the rest flat in freezer bags in the freezer. Great for topping yogurt or eating with milk. Combine everything in a very large bowl (I use my large stock pot as a “bowl” to fit this large of a batch). 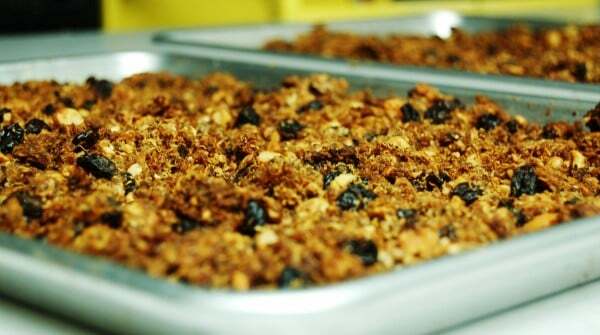 Spread the granola mixture over 3 large baking sheets/jelly roll pans. Bake for 30 minutes and then pull the sheets out, break up the mixture with a spatula and stir them up. Rotate your pans and place them back in the oven. Bake at 325 for another hour or so, but pull them out to stir and rotate pans every 15-20 minutes. The granola should dry out and not feel “wet” when it’s done. Baking times may vary - keep an eye on them – they can burn quickly if you aren’t watching! When cool, store in glass jars for short-term storage or in bags in the freezer. Nut-free variation -(If you are nut-free you can go with raw sunflower seeds. (Soak them in water and salt overnight though to help with digestibility.) Replace the peanut butter with sun butter. Serve your granola with organic whole milk (raw if possible!) or coconut milk, or on top of a quality whole organic yogurt or homemade yogurt! Store some at work in airtight containers and bring your milk or yogurt fresh with you every day if you like to do up breakfast at work. It is great just by the handful too! 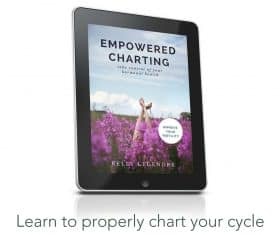 I get most of these ingredients in the bulk section at my local grocer and I typically price compare with Amazon before buying – it can go either way I have found! I do get my organic quinoa in large bags at Costco, but the same kind is on Amazon too. 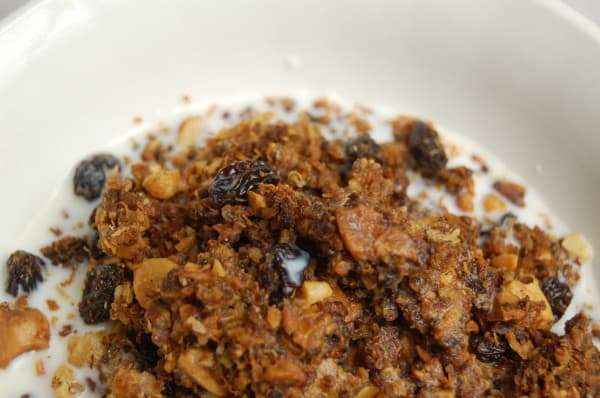 Last time I made granola, I burned my raisins to a crisp! Now I add them after baking. Also, quinoa is technically a legume, not a grain. It still needs soaking, though!